Abstract A new biflavonoid, 5,7,4′,5”-tetrahydroxy-7”-metroxy-[3-O-4”’] biflavone along with four known biflavonoids and one known phenolic acid was isolated from the herb of Selaginella uncinata(Desv.) Spring. Their structures were elucidated by spectroscopic methods. Selaginella uncinata(Desv.) Spring as a medicinal plant is used to treat acute infectious jaundice hepatitis, cholecystitis, enteritis and so on.In previous chemistry news articles about investigation of the plant, two kinds of chromone glycoside (uncinoside A and uncinoside B) have been separated from S. uncinata , which have good anti-tumor and anti-viral activity. Our preliminary study found that ethyl acetate extract exhibited good anti-HSV-1 virus and Cox B3 virus activity . Through activity-guided fractionation, we isolated a new biflavonoid, named 5,7,4′,5”-tetrahydroxy-7”- metroxy-[3-O-4”’] biflavone(IV), together with five known compounds：7,4′,7′,4”’– tetra-O-methylamento-flavone(I)，7, 7”, 4”’-trim-O-methyl amentoflavone(II)，7, 7”-di-O-methylamentoflavone(III)，amentoflavone(V), shikimic acid(VI), and all the structures of these compounds were elucidated by spectral analysis. The air dried aerial parts ofS. uncinata (10kg) was extracted three times with 95% ethanol at room temperature. The combined EtOH extract was evaporated in vacuo to afford a gummy residue (520g). The extracts were suspended in water and successively partitioned with petroleum ether, EtOAc and n-BuOH, respectively. The EtOAc extract (50g) was repeatedly subjected to column chromatography to yield compound I to VI. Compound IV was obtained as yellow powder, its molecular formula was established as C31H20O10 (m/z 552.1022, calculated 552.1051) by HRESIMS. The IR (KBr, n, cm-1) spectrum showed the bands at 3409 (hydroxyl group), 1656 (conjugated carbonyl group), 1603, 1500 (aromatic ring). The 1H NMR and 13C NMR signals of compound IV (Table 1) were very similar to those of delicaflavone except for the existence of the one methoxyl signals [d 3.86(3H, s)] instead of hydroxyl. All the above information suggested that compound IV was a derivative of delicaflavone. The methoxyl position was determined by analyzing the difference of proton signals between compound IV and delicaflavone , that is d value of H-6” shifted from d 6.38 to d 6.19, and d value of H-8” shifted from d 6.75 to d 6.47, respectively. 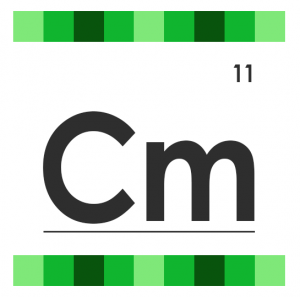 Which showed the methoxyl group was located at C-7”. This was further confirmed by HMBC spectrum, in which the signals at dH 6.75 and 6.38 along with signals of methoxyl group at dH 3.86 displayed correlation to dC 165.74. 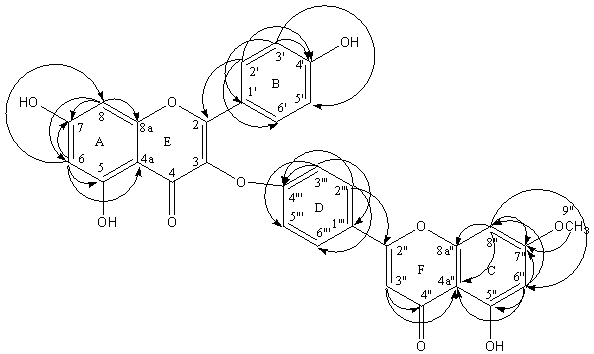 Therefore the structure of compound IV was elucidated as 5,7,4′,5”-tetrahydroxy-7”- metroxy-[3-O-4”’] biflavone. Ma L Y, Ma S C, Wei F, et al.. Chem Pharm Bull (Tokyo)，2003，51(11):1264-1267. Jiang H Y, Wu S C, Zhu J J, et al.. Journal of Jinan University (Natural Science Edition), 2008, 29(05): 500-504. Ilyas M, Seligmann O, Wagner H. Journal of Biosciences , 1977, 32C(3-4): 206-209. Gu Y L, Xu Y M, Fang, S D, et al.. Zhiwu Xuebao, 1990, 32(8): 631-636. Jiang Y, Qian Z M, Zhang T D, et al.. Linchan Huaxue Yu Gongye, 2008, 28(6): 58-60. Zhou C, Zhang R P, Pu X Y, et al..Chinese Journal of Ethnomedicine and Ethnopharmacy 1999, 37: 114-115. Lie C L, Cheng J C. The Chinese Pharmaceutical Journal，2000，52：211-218.